Debate in the B.C. 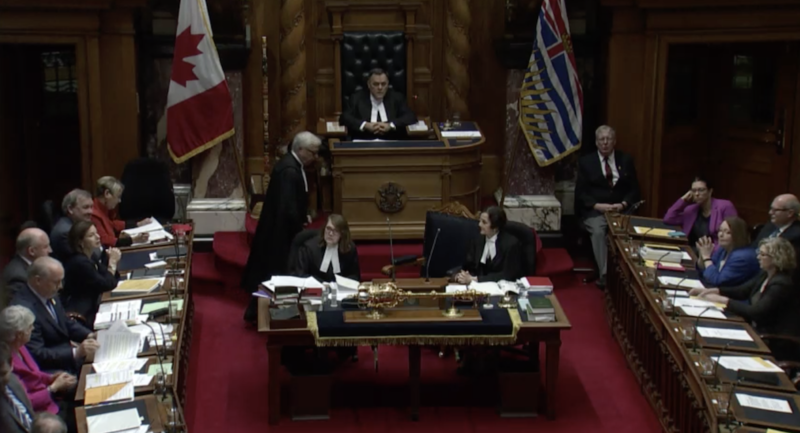 Legislature on Monday (April 16, 2018) on the Trans Mountain pipeline. T. Stone: Yesterday we learned from the Prime Minister of Canada that the Premier actually had nothing constructive to say to the federal government about ocean protection. Again, nothing constructive to say about ocean protection. According to the Prime Minister: “Unfortunately, over the course of almost a year, the B.C. Government has not specifically put forward proposals.” My question to the Premier is this. If he thinks that the Prime Minister is wrong, could he stand in the House today and indicate which specific proposals he actually has put forward to the federal government about ocean protection? Hon. J. Horgan: I welcome the intervention from the upland member from Kamloops South today in the House. He wasn’t in the meeting, so I don’t think that he can account for what happened inside the walls of the Prime Minister’s office. He can refer to the comments the Prime Minister made on his way from Lima to Paris. What we talked about exclusively was defending B.C.’s coast. That was the point. That’s why I went. We have been offering proposals at the officials level over the last nine months, and we’ll continue to do that. One of the upsides of the meeting was a reintroduction of each other to the critical issues that we want to bring forward. You’ll remember, in January, the Environment Minister brought forward five points that we wanted to talk to British Columbians about. That is, again, the role and function of the government of British Columbia. That was rejected by the government of Alberta as unconstitutional. I disagree. This side of the House disagrees. We’re going to be taking that question to a court of law to ensure that we have the right to protect and defend our coast. That’s what the people expect us to do, and that’s what we’re going to do. T. Stone: Well, the Premier says he’s focused on protecting B.C.’s coast, but when the Prime Minister of Canada asks him for something constructive, anything constructive, on ocean protection, he has absolutely nothing to say for almost a year — nothing except rhetoric and empty threats. So again, to the Premier: why has he consistently chosen to make empty threats instead of offering specific, real solutions on ocean protection for almost a year hence? Hon. J. Horgan: The member’s references are inaccurate. We spoke explicitly about the issues that are affecting British Columbia with the prospect of a catastrophic diluted bitumen spill — the impact on our lands, on our waters and on our coast. That was the whole point. That is why we intervened in two court actions when we formed a government that the previous government chose to ignore, and that is why we’re making a reference to a higher court to protect the jurisdiction of British Columbians. Not this government, every government from this point on should have the right to defend the interests of British Columbians. I’m surprised the people on that side of the House don’t agree with everyone on this side and the vast majority of British Columbians. A. Weaver: I must admit, it’s galling for me to hear members of the Liberal Party of Alberta opposite wax eloquently about ocean protection — an area that I actually served as an intervener on. I can assure you that when there’s an ocean protection plan that’s predicated on the existence of 20 hours of sunlight, nobody’s safety is being protected here in the province of British Columbia. Yesterday the Premier met with the Prime Minister and the Alberta Premier to discuss the manufactured conflict over the Trans Mountain expansion that has the side opposite, the Liberal members from Alberta, all in a tizzy these days. After the meeting, the Premier stated that he and the Prime Minister agreed to protect our coasts by working together to close gaps in the ocean protection plan. The federal ocean protection plan — let’s be clear, that’s Atlantic, Arctic and Pacific; it’s all three of them — doesn’t address the fundamental and unchanged fact that we cannot protect our coast. We can’t clean up the diluted bitumen if there we’re a spill. You don’t have to believe me, you can believe the Royal Society of Canada or the National Academy of Sciences in the U.S. expert panel reports. Will the Premier confirm that B.C.’s position is unchanged today and that he will use every tool available to him to stand up for our coast, for science and for our economy in the face of the proposed reckless federal intervention in the Trans Mountain expansion? Mr. Speaker: Premier, before you answer the question…. Member, if I may ask you to retract your comment about the Liberals from Alberta. A. Weaver: Sorry, I retract the comment about the Liberals from Alberta. I was trying to suggest that the members opposite are not putting the interests of British Columbians first, are representing external interests. Hon. J. Horgan: I thank the member, the Leader of the Third Party, for his question and, particularly, the reference to the Royal Society of Canada and the gaps there are in the science, which, again, brings me back, also, to the question from the previous member. The government of British Columbia has been meeting regularly with the federal government on the ocean protection plan and discussing the gaps in knowledge, the gaps in science that have been acknowledged by the Royal Society. In fact, that was the foundation of our intervention to go to the public and talk about these issues in January. I reaffirmed those points, hon. Member, to the Prime Minister and to the leader of the government of Alberta. I said very clearly and without reservation that the province of British Columbia is extremely concerned about the consequences of a catastrophic bitumen spill. So even some members on that side, hon. Member, agree with us that there is inexact science. We need to do more work on the subject. Mr. Speaker: The Leader of the Third Party on a supplemental. A. Weaver: There’s growing evidence to suggest that Kinder Morgan set their outrageous ultimatum as either part of an exit strategy or in order to hand over the financial risk to Canadian taxpayers. During the NEB hearings on Trans Mountain — I get that the people opposite don’t understand the economics of this — the company brought forward projections that the price of oil in the base-case scenario — if any of them had read the NEB process, they would understand this — would be $100 a barrel. Its best-case scenario saw prices reach $150 a barrel by 2040. Since then, the development and discovery of new shale oil deposits, as well as OPEC policy changes, mean that oil has been trading at between $40 and $60 a barrel. Even the most optimistic forecast for 2020 is out around $70 a barrel. Despite this new reality, the federal and Alberta governments seem committed to transfer the economic risks onto Canadian taxpayers. My question is to the Premier. Did he bring up with the Prime Minister the notion that subsidizing this project exposes B.C. taxpayers and Canadian taxpayers to massive risk at a time when there is growing uncertainty about Trans Mountain’s economic benefits, if any, and that it is not in line with the type of economic development needed to position Canada as a leader in the new economy? Hon. J. Horgan: I thank the member for the question. We did raise, with the federal Minister of Finance and the Prime Minister of Canada, where the economics were in having the government of Canada intervene on behalf of an offshore company to invest B.C. and Canadian tax dollars in a pipeline, when there were other more constructive investments that they could make in the new economy, in the green economy. Or, at a minimum, even if they wanted to invest in diluted bitumen, to work with all parties…. I’m sure members on that side of the House would agree that if we could create more jobs in Canada by adding more value to our raw materials, whether it be diluted bitumen or logs, we should do that. That was rejected by the government. They chose the course that I believe they’ll be laying out for the people of Canada in the days and weeks ahead, and it’ll be up to the Members of Parliament to debate those mechanisms, those tools, as they come forward. But it will be up to British Columbians and all Canadians to ask themselves if this is an appropriate investment of tax dollars. This Hansard record of debate in the BC Legislature is excellent in that it clearly and in detail give us a picture of what has motivated Premier Horgan (supported by A. Weaver) to stand steady in their court action. In fact it is well known by research into actual spills of Dilbit (diluted bitumen) that would be carried by the KinderMorgan pipeline reveals the huge difference between cleaning crude oil and Dilbit. Here’s a clip at the end of a lengthy article in “Inside Climate News” (by Lisa Song)… Anthony Swift, an attorney at the Natural Resources Defense Council who has spent years studying the tar sands industry, said the Marshall spill points to the need for more stringent dilbit regulations. The Marshall spill is not the largest oil spill in U.S. history, but it is by far the most costly. Using figures from PHMSA’s pipeline incident database, Swift calculated that the average cleanup cost of every crude oil spill from the past 10 years was $2,000 per barrel. The Marshall spill has cost upwards of $29,000 per barrel. I read the article as pretty self-explanatory.